I had originally planned to do a gallery wall around the TV with colorful framed pictures, but I’m doing framed art on the wall with the pantry door, so doing that on both walls just seemed like too much. I wanted to mix it up a bit, and I also wanted to keep this wall kind of simple. So plates and lanterns seemed like a good way to mix things up while still adding some color, texture, and dimension to this wall. I searched all over for lanterns that I really liked. I actually purchased and brought home several options from Pier 1 and Target (including these, these, and these), but in the end I went with these from Hobby Lobby. They didn’t come with hooks, so I picked those up in the garden department at Lowe’s. I still need to paint the screws black and get some candles for the lanterns. The green and white plates are from World Market (here and here, but in the store they’re sold individually). The aqua plates are from Marshall’s. And the purple plate is actually a white plate from Target (this one) that I primed with spray primer, painted with some leftover latex paint from the buffet (Behr Voodoo) mixed with some white, and then topcoated with Rust-Oleum Triple Thick Glaze (this is what I used) for a high gloss shine. That was kind of a temporary fix since I couldn’t find any purple plates. What I’d like to do is go to the local pottery painting place, paint my own purple plate in just the right color, and have them glaze and fire it for me. This purple plate looks fine, but since I painted over a super glossy glazed finish, I doubt it would hold up well over time with being dusted and cleaned regularly. The sage bush is from Magnolia (found here, but I got mine for $12 during their warehouse sale in January), and the gold parrot on the perch is from Target (right here). I’d like to find something to go on the other end of the buffet, but I haven’t found anything just yet. So it’s getting there! I still have two building/upholstery projects to do (fabric is on order and will hopefully be here this week), some pillows to make, artwork I want to paint, and just a bit more accessorizing to do before I can call this room finished. As long as my fabric is in stock and ships soon, and I don’t have to deal with another backorder, I’m certain this room will be finished this month. Lately, I’ve been doing quite a bit of daydreaming about how I’d decorate the house that Matt and I hope to purchase in the near future. One thing I know for sure is that I want to use more neutrals in my decorating, but I can’t go with a completely neutral palette. That’s just not me. I love color way too much to live in a neutral home. And I think I may have found it right on the cover of the latest issue of House Beautiful. As soon as I pulled that magazine out of my mailbox and I saw those colors, I fell in love with them! The colors may not be clear in the photo above, but the purple is a beautiful grayed purple, along with teal and bright green. Yep. In November 2012, I had decided that I wanted teal, green and purple. Then a year later, we bought the house, and I forgot all about that post. In 2016, I got way off track and had a frustrating year where I felt like I accomplished nothing. And now, in 2017, I’ve come full circle without even realizing it until just two days ago. I’m right back here with my plan that I came up with in November 2012 — teal, green and purple. 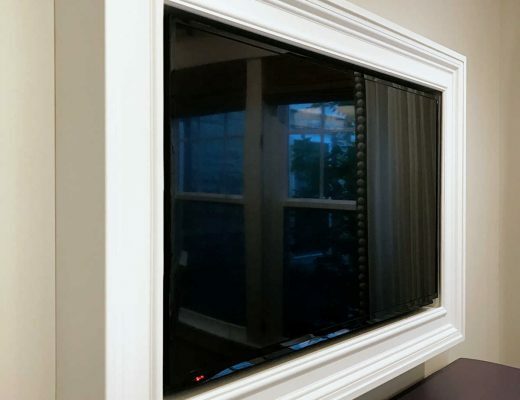 Custom DIY Frame For Wall-Mounted TV – Finished! Four Random Things – Draperies, Dining Chairs, Rugs, Etc. Previous Post Custom DIY Frame For Wall-Mounted TV - Finished! Love the “TV Wall”. Put the timed candles in the lanterns. No fudd. No bother. Love having them round the house. Love how the room is shaping up! As an aside, we had Sling for 1 month and hated it. We switched to Play Station Vue several months ago and like it much better. Comparably priced, better reception (if that’s the right word) and more of what we watch. Can be played either through Amazon Fire Stick or Roku or some of the Play Station game consoles which Matt may already have. Love it! FYI, your link to the Magnolia sage bush takes you to Target. Nice! I’m going to order these! Kristi – Room looks amazing! I have black lanterns on shelves in my great room with Luminara battery candles. They are the most realistic ones on the market. You can get them at Bed, Bath & Beyond with a coupon for around $28 each. They have a timer and take 2 D batteries. I have 5 of these in my home and they are almost like extra lighting at night. I love them in my lanterns. Have fun getting the rest of the room done! 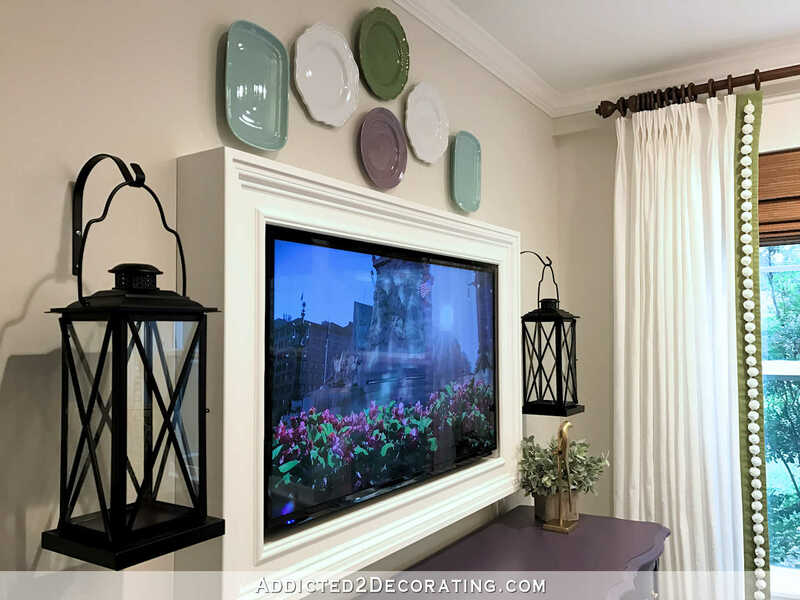 I too thought a gallery wall for around your TV to help blend it in but this is so much better…..simplicity at it’s finest and it looks perfect. I’m giddy with excitement waiting to see the finished room. Keep up the great work! This is really so lovely. It reallly came together! Love your style! Looks great! A gold/brass framed picture of you and Matt would look great on the left side of the buffet! This is looking great! I can’t get over how much I love the purple buffet. How about something functional for the left side? Like a bowl to hold real breakfast fruit or a pretty jar of your favorite cereal or snack food (or cat or dog snacks)? Or, since it’s near the door, a bowl or basket to hold car keys? I have that golden parrot in my living room. I am definitely coveting that bird!!! Everything is coming together beautifully. I know you said you got your rug on Overstock. Can you tell me the exact name. I love it. Just be aware that they gray is darker in person than what it shows in the picture. In fact, my door is painted Benjamin Moore Kendall Charcoal, and the gray in the rug is almost the exact same color. I was a little disappointed at first since I was expecting really light gray, but this has really grown on me. 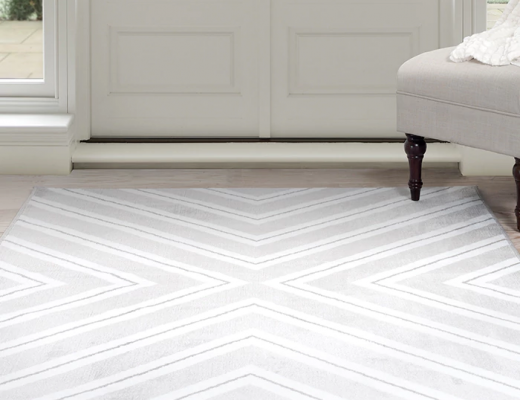 Plus, the rug is really soft and feels great under foot. That room is so inviting! I love your tv wall and the decor you selected for it. So neat about your color choices in your previous post is what you landed on! This is so pretty and what a lovely view as you stand at the sink and look into the breakfast room. The colors you are using are so bright yet soothing together. I especially love the tone of the purple and that you painted a plate to pull that color into the arrangement. It is all coming together. Couldn’t adore this room more. How about a simple stack of books on the left side of the buffet? Maybe covered in solid purple gift wrap? Or gold, or….. This is so pretty! And so peaceful! 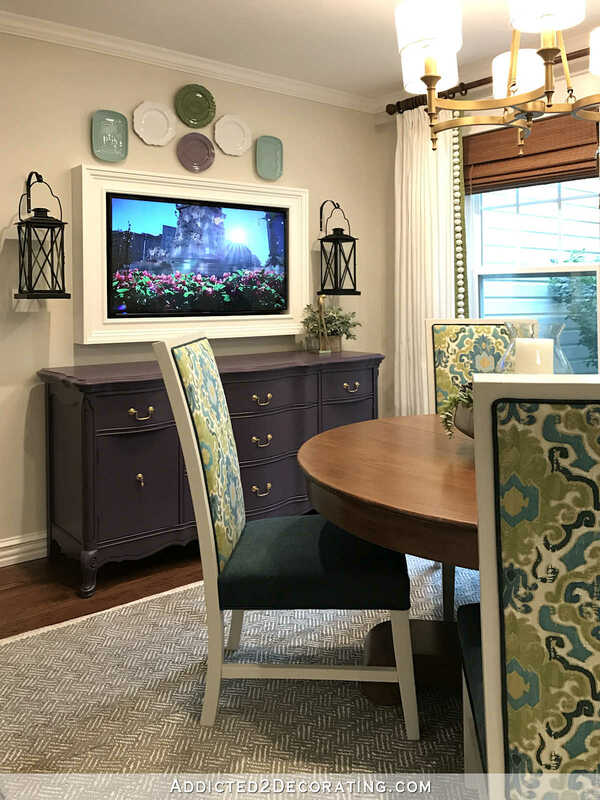 The buffet is perfect for the space and the color is beautiful! How about a distressed gold tray with crystal glasses and/or decanter for the other side of your buffet. Love everything you do! It’s looking lovely and I want to do lanterns next to a chalkboard I have in my foyer, so you’ve given me some great options to think about! I can’t tell from the picture–how do you hang your wall plates? I’ve tried several options and wonder what works best for you? Those are by far the best and easiest way I’ve found to hang plates on a wall. The hangers are completely invisible once the plate is hung, and the adhesive is very strong. Plus, if you decide you no longer want to hang the plate, the Disc is removable just by soaking the plate in water. This has been my go-to for hanging plates every since I learned about them (probably 5-7 years ago). You can also get the Disc adhesive hangers at Hobby Lobby (in 2 sizes)……which is the only store I have ever seen them in as I am always on the look out. Kristi, how do you hang plates on the wall? I was playing with your plates because in ever picture something looked off and when I was playing I see it, it is the aqua plates they should be moved up to the middle of the white plates. I like the green plate but you have 2 aqua and white plates that the 1 green and purple plate looks off. I wish I could show you the pictures that I did. one was green, aqua, white, 2 purple, white, aqua and green and the other was aqua, white, 2 purple, white and aqua. I actually like the aqua plates where they are. Their current placement ties them to the TV and makes the entire wall look like an arrangement. In my eyes, if they aqua plates were higher, then the plates would be a separate arrangement and not tied to the TV. But, that’s just my eye. I agree. I love the arrangement of an arch over the tv frame. Perfection. What the heck^^^ is this a new concept I’ve not heard of? lol, just kidding….my mom used to do this every day, not me, I was in the ball fields with the kids. I have to say I Love this color combo much more than I ever thought I would and can see your vision since its all coming together. For your buffet I think a long flat serving piece would look amazing. On mine I have a wooden leaf with 2 giant acorns, flat, yet 3D. This TV wall looks gorgeous. 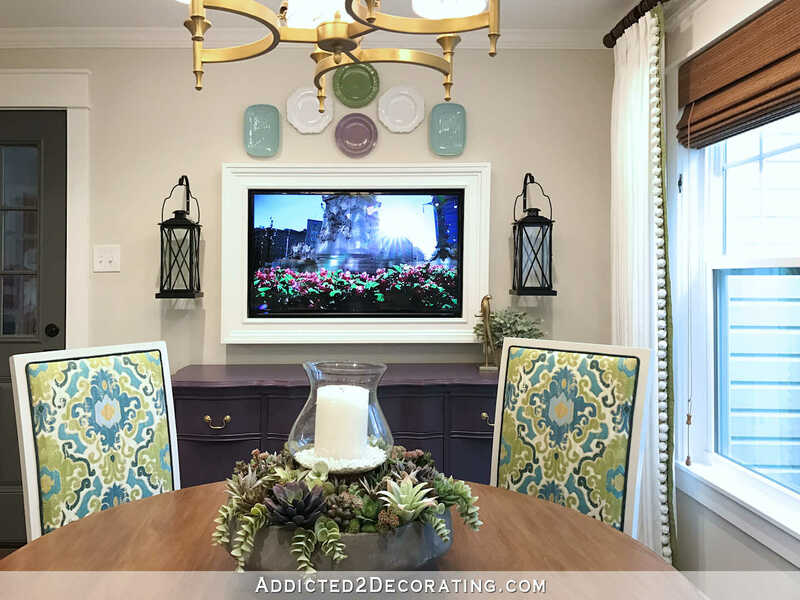 Love the decor Kristi, it’s the perfect arrangement around your TV/frame. The color of the plates tie everything together. I know I’ve said this before, but the Voodoo purple color on the buffet is absolutely stunning! How exciting that you to get some ‘pretty stuff’ done with decorating. This room is gorgeous! This room is beautiful! Especially if you look at the before pictures. It is absolutely unbelievable what you have accomplished in here. I think I say that about each room you do, but this one took extra hard work. You and Matt are certainly going to enjoy this space! So excited to see what you have done. 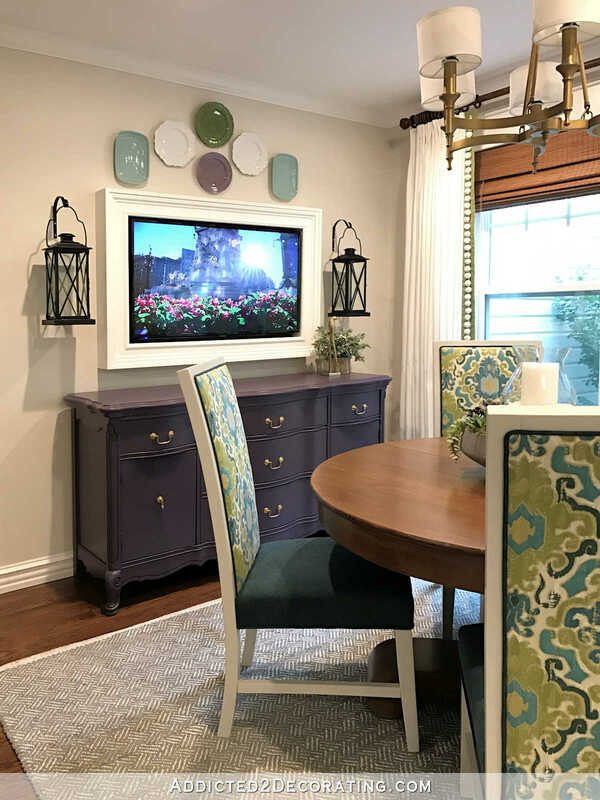 I have to say when you first said you were going to paint the buffet purple I could not picture the color along with the chairs, but WOW was I ever wrong!!! I absolutely love it all together!!! I should never doubt you on this matter, and so sorry I did. And I love the wall. The plates and lanterns are beautiful. I cant wait to see what comes next in this room. My exact experience! I guess that’s what’s special about a decorator’s eye. Everything looks great! 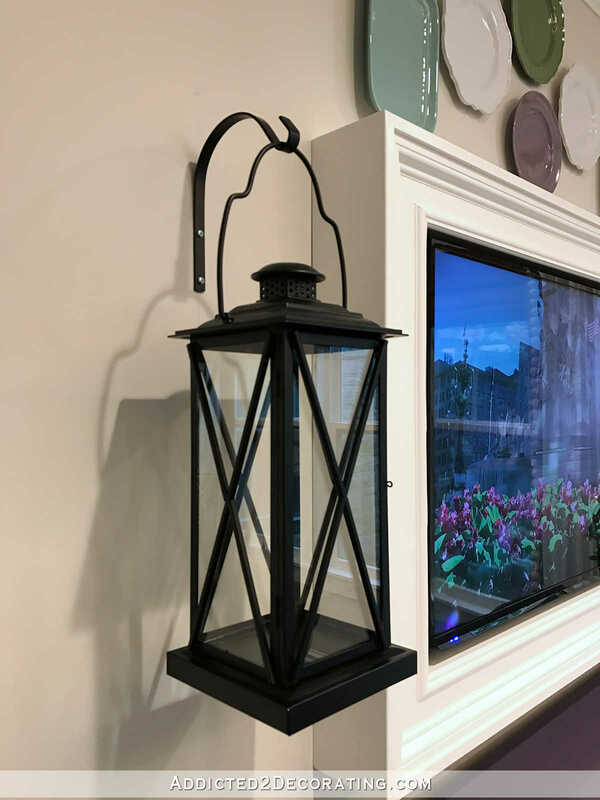 I am planning on hanging a lantern on each side of a painting in my kitchen and seeing yours makes me sure I am going to do that! Will you tell us what you use to hang your plates on the wall? The plates added the finishing touch! Very nice! Have you ever checked the Dollar Store for plates? Surprisingly, sometimes they have some pretty cool colors ( but not always. ) Just pop in from time to time and see what they have. I think for the left side of the server, a large brass shallow bowl would look nice. If you wanted, you could maybe use leftover fabric ( if you have any!) and roll a few squares in some napkin rings to put in the bowl.It would bring the patterned fabric over to that display. Awesome that you found your old post, and it affirmed what you had wanted all along! Maybe I should start a journal, since there’s no way I’d do a blog! LOL! I could not handle the critics! I do like the plates because they bring all the colors together. I felt like the purple looked out of place until you added the plates. You know what you ‘should do’? Heh heh. You should listen to yourself. You give good advice! Absolute home run! I love your sense of style! Kristi, in love with the space. You did a fabulous job and the colors are perfect. Please don’t change it! LOL. Beautiful!! Your breakfast room is beautiful! I love the neutral wall color. Can you tell me the name and brand? It’s Benjamin Moore Classic Gray. This is absolutely gorgeous! I’m with another here as far as less is more on the buffet! It speaks for itself! I love all of it…plates, colors, etc!! What paint color is your wall? It’s a beautiful cream-beige color. It’s Benjamin Moore Classic Gray. It’s the perfect barely-there neutral — not beige, not gray, but somewhere perfectly in between. AWESOME story about finding the 2012 post! I’m so glad you found your way back to YOU. You know it’s right now, since it was there all the time! I do think that even though personal styles change there are some things that are just right for a person, and don’t really change with time. This looks beautiful!!! But more importantly, it looks like a home, instead of a house! Congratulations on having some coziness and finished-ness (yeah, I know that’s not a word) after all your insanely hard work! How does Matt feel about this? He wanted this room to be able to sit in with you didn’t he? It’s stunning. I love the purple buffet and your makeshift purple plate. When I first saw the photo I thought, Now how did she find such a perfect color match! That’s a great trick. The plate display brings it all together. What a great place to start each day. Nice job! I’d like to suggest a low woven basket on the left side of that buffet. I think I remember reading that exact post from 2012. I thought you were crazy to add purple in the mix back then but now that I see it, of course it looks amazing. I can just see that tv playing the Fireplace video using your firestick. A crackling fire in the background for a holiday family meal. Perfect. I think Fiesta has purple plates. It has come together so beautifully! So happy that you and Matt have this gorgeous, mostly finished room to use and enjoy! At last! The room is beautiful! I love it. I love how things come full circle. your room is gorgeous and I just love that frame around the tv. Gosh I love everything you’ve done-the TV frame is what caught my eye, you are so clever! I always love how you pull off teal. I try to deviate from my lifelong attraction to neutrals and always seem to come back to them. Especially with an industrial vibe. Your house is turning out great! Normally I love all of your projects but I have to say this one shocked me. I love the lanterns — such a nice touch. But I do think that in such a small room the addition of the plates just adds distraction and noise here. I think the TV with the trim and lantern is enough. Still, I love tuning in every few days to see what you have going on.. so fun to watch and learn from you. Oh I love it! 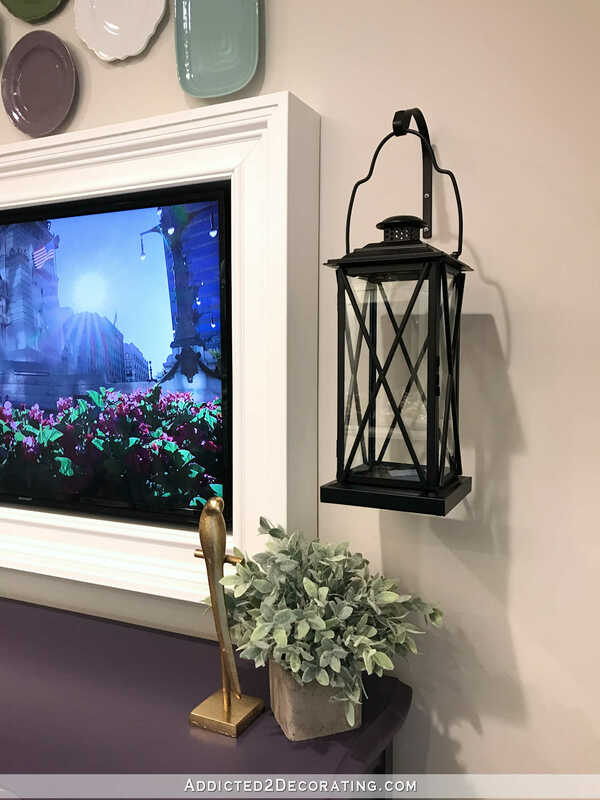 The TV looks great framed and the lanterns really add such a nice interest. LOVE the colors!!!! It is a WOW room! I love that when you couldn’t find what you needed shopping, and instead of getting derailed, you decided to make your purple plate! That is so fun! I may have missed it earlier on before I found your site, but where did you get your beautiful chandelier? Thanks! That is not a bad price then. 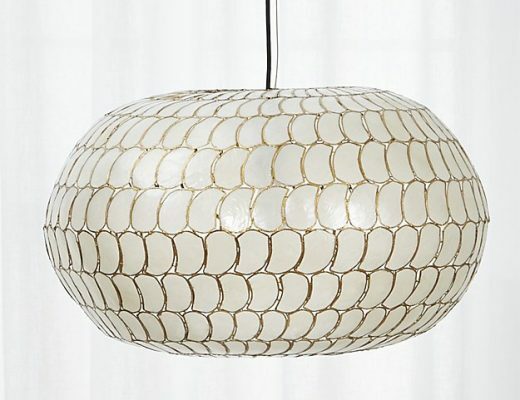 I find lighting can be hard to shop for because it either looks too cheap or it’s in the un-affordable price-range. But for that beauty I would pay that:) Thanks! I thought I recalled some purple discussion before. Let’s just blame your detour on Cameron Diaz. Her dark city kitchen is cool but this is lovely and alive looking. I am perfectly fine with nothing on the other side of the sideboard. However it is near a door so maybe a tray or relatively flat basket to catch things that people are going to want to place there coming and going, like keys, to protect that beautiful aubergine surface. Nice job Kristi. Are you going to finish the living room next? Everything you do – when done to your complete liking is absolute perfection! I love looking at your finished rooms – they are so incredibly beautiful! Thank you for all you do and for sharing your talents.